Suggested dose for adults: 1 capsule 2-3x daily on an empty stomach or as directed by your health care practitioner. Primary action: R-Alpha Lipoic Acid is a coenzyme used in energy production in cellular metabolism and functions as an ideal antioxidant. R-Form Benefit: Conventional chemical synthesis of lipoic acid yields a mixture of R- and S-enantiomers. 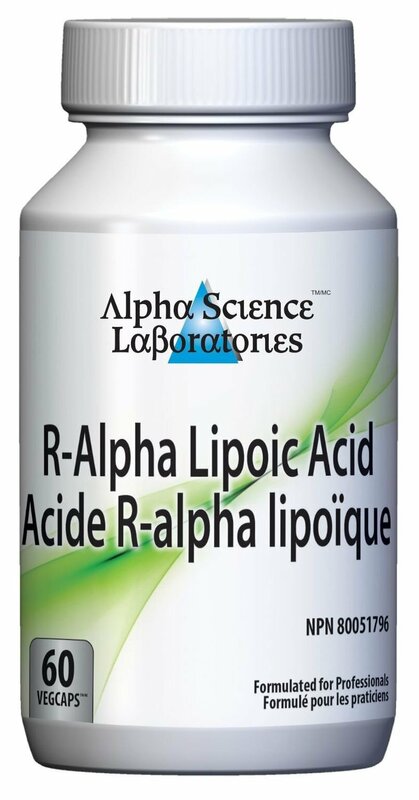 Lipoic acid from Alpha Science is processed in such a way as to yield the active R- isomer only with purity guaranteed to be higher than 99%. Bioavailability of R- and S- alpha-lipoic acid has extensively been studied. After oral intake of R- and S-alpha-lipoic acid, at least a 60% higher response was found for the R-form than for the mixed (racemic) form, which would include the S-form. both water-soluble and membrane-soluble characteristics, enabling it to reduce oxidized antioxidants at the lipid/water interface. R-alpha-lipoic acid also acts as a metal chelating agent which explains the usefulness of lipoic acid for the detoxification in heavy metal poisoning.